Rep. John Mica (R-FL) no longer chairs the House Transportation Committee, but that doesn’t mean he’s eased up on his crusade against Amtrak. Calling the company a “Soviet style monopoly,” Mica used his afternoon address to the U.S. High Speed Rail Association to announce his plan to revive his despised and defeated measure to privatize parts of Amtrak. Of course, high-speed rail in California is open for bids from private, mostly foreign, firms, and many have expressed interest. Fully private entities are moving forward with rail projects in Florida and Texas. Amtrak simply doesn’t have the stranglehold on rail in America that Mica tries to convey. And in the sense that Amtrak does have a broad network of lines, it’s in large part because it was created by Congress and is partially funded by taxpayers with a mandate to provide mobility services to the country. To illustrate the land of milk and honey that awaits rail privatization, Mica cited the European Union’s decision to end state rail monopolies. Perhaps he isn’t up to speed on the latest news: The European Commission planned last month to break up the monopolies and open the rail system to free market competition but took a step back from that two weeks later due to opposition, favoring instead a proposal that will allow Germany and France to keep their state-dominated systems. Meanwhile, rail privatization in the UK has let to a tripling of fare prices and plummeting investor confidence. 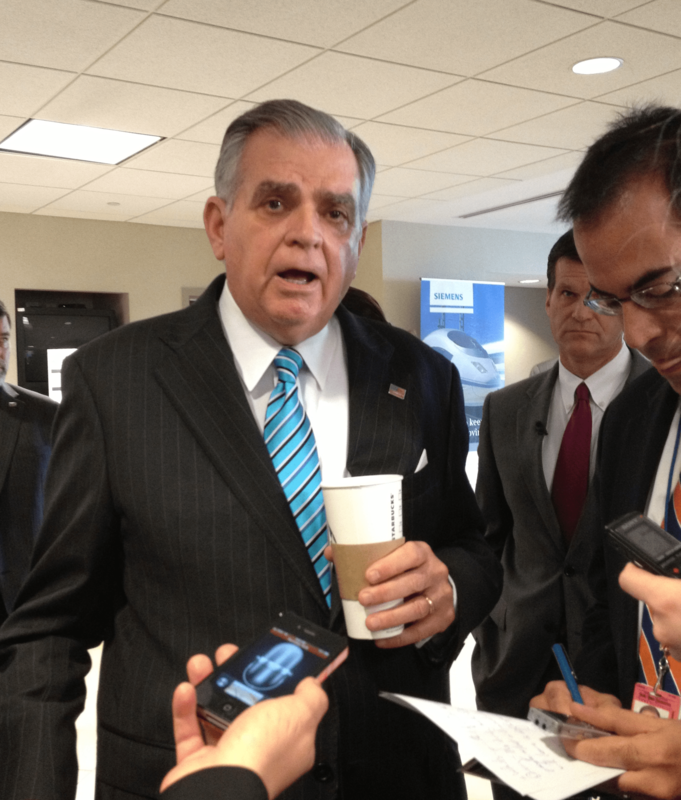 Earlier in the day, Transportation Secretary Ray LaHood also had an anecdote from Europe and Asia. He’s toured 18 countries’ high-speed rail systems during his tenure as secretary. “The common thread in every country was the idea that unless the national government makes the investment in high-speed rail, it will not happen,” he said. Mica hopes to include his privatization proposal in the Passenger Rail Investment and Improvement Act reauthorization this year. The last time he tried to include a similar idea in the surface transportation reauthorization, the proposal was so widely panned he had to retract it. Mica now has no leadership post within the committee. He is the senior member of the Rail Subcommittee but not the chair or the vice chair. Mica also took the opportunity to castigate President Obama for promoting a vision of high-speed rail access for 80 percent of the nation in 25 years, saying the administration has “wasted” $10 billion on high-speed rail. The conference featured much talk of “detractors” – people like Mica who try to tear down the progress being made on high- and higher-speed rail. One by one, the speakers talked to the assembled crowd as the vanguard of a movement whose time is coming, visionaries still confronting those stuck in the past. John Mica likely would consider himself one of the catalysts of change. But it’s not the kind of change his audience was looking for. Is this proposal to privatize the rail car service, or that as well as the tracks themselves? If its the former, that sounds like what we already have with roads and air- with the autos and the airplanes being privately run, but the roads and the airports and traffic control being government. Funniest aspect of Rep. Mica’s adolescent tirades against rail is his characterization of Amtrak as “a Soviet style” system. Last time I checked, the Soviet Union was long gone and RUSSIA was building 200mph+ oil free, electrified High Speed Rail. Hell, even many of Russia’s current trains are better/faster than the current U S state of the art. Bobby Jindal put it best. The GOP needs to stop being the STUPID PARTY! Our interstate highway system is subsidized. Our aviation system is subsidized. Why shouldn’t the passenger rail system be subsidized? And why is it that the Greed Over People Party won’t work to make laws that are already on the books better laws than trying to dismantle our for of government? And of course the freight railroads (who helped create Amtrak) have zero interest in running passenger service. This is a politico indulging some pet peeve. Poor benighted soul. Sorry, Dana but Florida East Coast Ry (Fortress Capital) is in the planning stages of a modest conventional passenger rail network for Florida. If it works out, they will have laid the ground work for incremental HSR development and will have a right-of-way monopoly which could be quite profitable in the future. Also in the case of both California and Florida private rail operators/manufacturers have voiced willingness to build/operate HSR as long as they have a LEVEL PLAYING FIELS vis-a-vis the massive subsidy that roads, air already enjoy. The Republicans look like complete fools on this but they have become so accustomed to lying that they don’t even know what reality is anymore…. Improved service on existing rail lines is a good start towards higher speed service in the future. Government investment in high-speed rail has led to private operations in some countries, but the fares are a lot higher. GOP needs to stop acting and talking stupid!